Zombie Math Teacher: App Mashup Volume 2: Pic Collage + iMovie + Google Drive and Coordinate Graph Art: Elementary Edition Update! App Mashup Volume 2: Pic Collage + iMovie + Google Drive and Coordinate Graph Art: Elementary Edition Update! From "Happy Spring" to "Happy Fall", all in one blog post. OUCH. I'd say I'm sorry, but... I'm not. Honestly life is moving at such a break-neck pace right now that it's a gift just to take a deep breath a few times a day, get some exercise a few times a week, and if I'm REALLY lucky, sneak in a nap here and there. When I think of how far I've come (and the rest of the world as well) since my first blog post in 2011, I'd say the old Zombie would hardly recognize the new Zombie. I'm guessing you readers feel the same? Can I get an "Amen!"? For starters, I value my sleep a little more than I used to. Having moved within 2 minutes of all the schools I visit on a daily basis, knowing that I *could* and SHOULD be getting 7-8 hours of sleep, I sometimes actually do sleep 7 hours. So I'm more a figurative Zombie these days than a literal one. 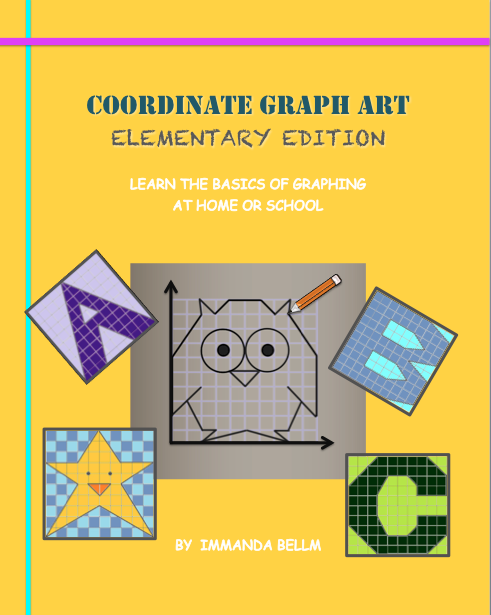 Coordinate Graph Art: Elementary Edition is now in the works! 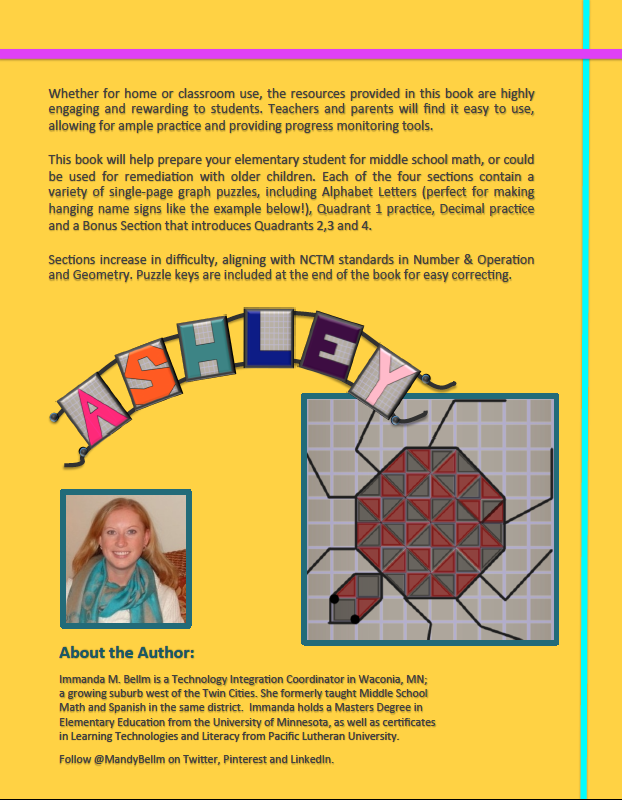 The idea for this book has been stuck in my head for years... ever since I wrote my first edition... but it seemed more appropriate to write Advanced Graph Art first so that those high-flyer students could keep working, than to back-track and start writing for a younger audience. I knew I wanted to open with an ABC section of Graph Art, so children could not only practice beginning graphing skills, but could also make a set of their name letters that could be connected into a banner for home or school use. Hence the example on the back cover, which is yet another tribute to my late sister Ashley in the coolest way I could think of :) LOVE YA SIS! Enough shameless plugs for my various products... I did have a point to this post... I suppose I should get to it! Alrighty then - App Mashup Volume 2... I'm currently working with our Elementary Spanish teachers to incorporate our 1:1 fourth grade iPad project into their classes. When you only have 20 minutes per day with each class, it's hardly worth the trouble to get out the iPads, try to train the kids on an app or get to a website, and then have any time left over to learn new content. My solution? 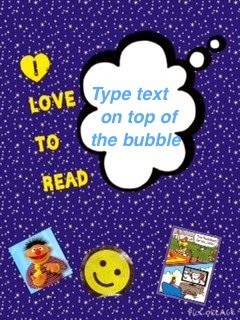 Start with an app the kids are already familiar with. Pic Collage. It's free, doesn't require any accounts to be made, and is extremely easy to use. Here's an example of a completed Pic Collage. It's like a virtual scrap book page. You choose a background, then overlay stickers, photos from your camera roll, images from the internet, text, and then easily turn/twist/size/layer them to your heart's content. There is zero limit to a child's creativity... give them a topic and let them go nuts. I'd put this app in the "M = modification" level of SAMR, because there is so much added functionality and student input required in synthesizing together the various pieces of content that they chose in a meaningful way. When finished, simply export to your camera roll and email/upload/post it anywhere. The mashup comes in when you take various Pic Collage images and send or post them to a common location. In this case, I want to use iMovie to compile all the Pic Collages together and then dub an audio track over the entire presentation. 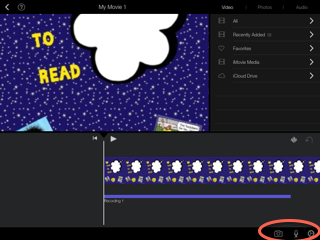 Whether you choose to have multiple students work on their own Pic Collage, and then have one master student (or the teacher) compile the images into the iMovie, is totally up to you. 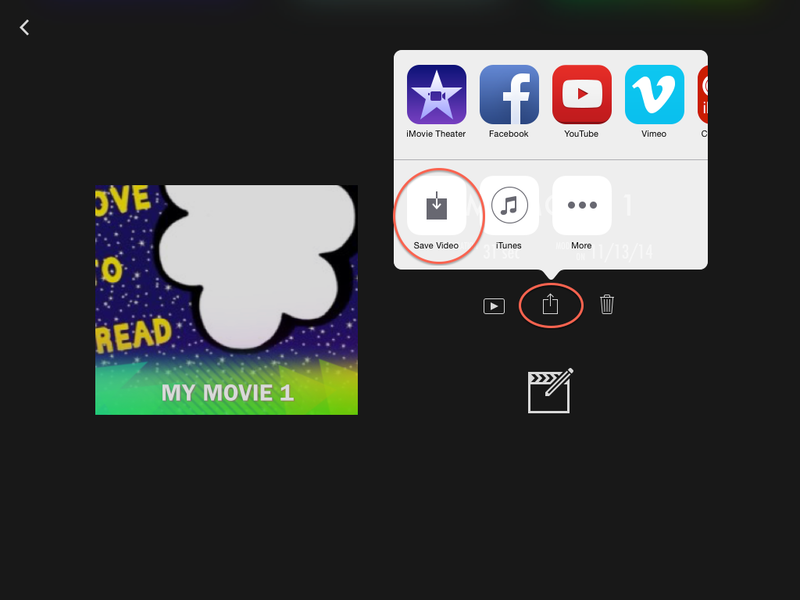 When you are ready to begin the iMovie portion, you select "Movie" instead of trailer, and then add each of the Pic Collage images into the video in the order you would like them to display. The next step is to record the audio to go with each image. If students are involved, you can call them up one by one to speak about their portion (talk loud for the mic!!!). Otherwise, you as the teacher can record your own audio that covers the entire video. Last, adjust the length that each image displays, to match the audio clip that pertains to it. Play the whole video back to ensure it is correct, before exporting the final draft to your camera roll. Once you make this step, you will lose any editable features in the compiled video (unless you keep the pieces on your device and in iMovie - which take up a lot of space!). To export your video, click back to the main menu for your video. You should see the title, the duration, and the last modified date. Click the export box with the arrow pointing upward (circled at left). Then select "Save Video" to export the video to your device's camera roll. From there, you can send anywhere. BUT keep in mind, it's probably a very large file size... so you can't just email it around. Which brings me to the last step of this App Mashup - sending your project somewhere for an authentic audience. If your school uses an LMS (we use Schoology), you can go into the app and upload the video into a media album, post as an update, or add to your personal/group/course resources. 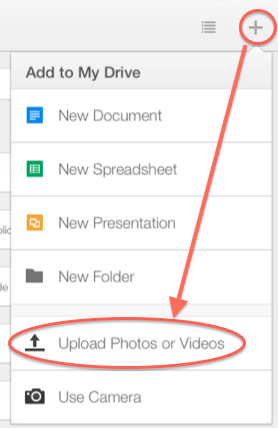 If you don't have an LMS, or want to avoid that step, you can upload your video to Google Drive from the Drive app (either Droid or Apple). Launch the app, then hit the + button and select "Upload Photos or Videos". Click on "Photos" and then pick the video(s) and other media you want to upload. Click the blue checkmark. Once it's done uploading, you're ready for the final step. And the most annoying one... because now you need a computer... so boot up your Google Drive and click the "sharing" button on your video. You need to change it from "Private", to "Anyone with the link can view". You cannot do this final step from the app (yet!?!? ); all you can do is add individual viewers' emails which is too tedious unless it is a student sharing with only one teacher. At any rate, once you have added the viewing audience, you can copy/paste the link to the file, and then post it or email it to any authentic audience, anywhere on the planet... or in cyberspace. **Please keep in mind, if any students' personal information or photos are present in any of the parts of the video or Pic Collage, you will need to obtain written permission from the student and/or parents (if a minor) before posting takes place. That's it for now! I hesitate to give you project suggestions of how you could incorporate this mashup, because your goal with technology integration should *really* be on what your instructional / curricular objectives and learning targets are. If you have decided on those aspects of your assignment, and this work flow fits into what you or your students are doing, I'd love to hear about it! Post a reply and let me know what worked/didn't work or whatever questions you have about the whole process. Child learning has introduced an Software Parent teacher app for communication on daily purpose. it can help to grow your child with more knowledge and more safety.